Also known as H.R. 3261, this bill was introduced in October by Representative Lamar Smith, in cooperation with 12 other co-sponsors. One can discuss the bill at length, but the bottom line is that it aims to give more power to copyright holders and the U.S. Department of Justice to take web sites to court; that is, web sites that are accused of copyright infringement. The chances are that you’ve already chosen your side in this argument, but just in case you want to learn more about SOPA and how it will affect you, I suggest reading this SOPA FAQ presented by CNET. It was first published in November last year, but it is updated when developments crop up. In any case, if you want to take a stand against SOPA in your own little way and you use Google Chrome, here is a nifty extension that will make it easy for you: No SOPA. No SOPA has a simple goal: to inform users whether the web site they are visiting supports SOPA or not. Let’s say you visit a web site, and it is a known supporter of SOPA. Your Chrome window will then display a notice bar at the top. 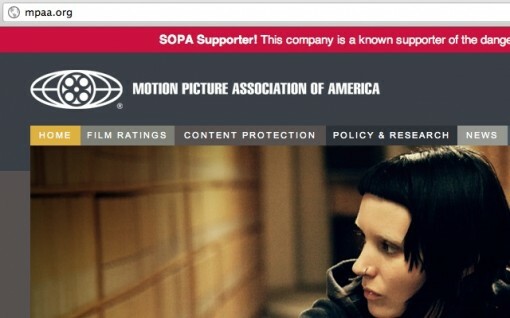 One can hardly miss the red bar saying “SOPA Supporter! This company is a known supporter of the dangerous Stop Online Piracy Act”. The deliberations about the bill are currently on hold, but they are supposed to resume some time in the middle of this month. If you want to contribute to the stoppage of this bill in your own little way, using No SOPA is one thing that you can do. If you use Google Chrome, that is.